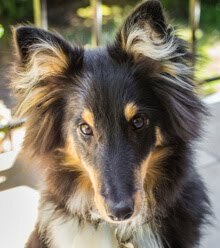 Callie celebrated (well no, she didn't) her two and a half year birthday last week. So here she is out in the vineyard totally unaware and not giving a damn. It's funny. She'll be standing out there looking around and sniffing, all perky with her head and ears up, tail up, looking beautiful. Then I point the camera at her and she goes into the submissive pose you see here. Head down a little, ears lowered a bit, tail between the legs. Then I think, why did I take this picture? The big logs. My goal is to cut the row on the right for this winter. I'm almost done with the pile on the right. The rest is for 2010. There was a small amount of wood left over from last winter. A very small amount. Before I got started with the serious cutting, I cut up a big pile of grape trunks that we've had for a couple of years. They're too big for the stove, but the new chevalet (saw horse) made it very easy to cut them in half. 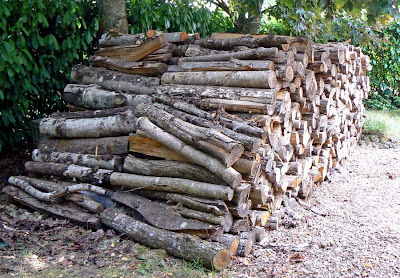 Each of the big logs is meter long, and they get cut into thirds. The storage area. The cut grape vines and fallen wood are on the right. 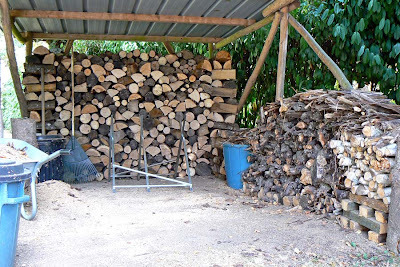 The big pile in the back is three logs deep so far. I'll finish this up in a few more days. 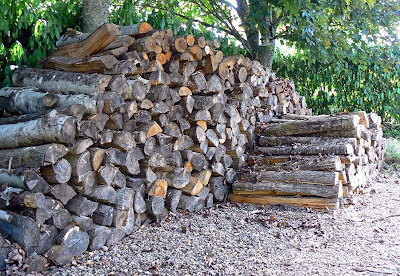 That should give us enough for the winter. My next task, to complete in September and October, is the hedge trimming. I want to finish that before my trip back to New York. I thought this was funny. It's as though one of the grape vines is trying to escape from its row into the wilds of the woods, trying to sneak away while no one is looking. 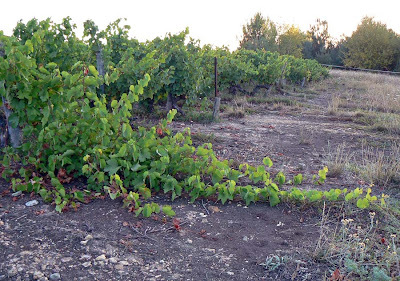 The vines are pruned during the growing season to help channel the plant's energy into the fruit. It's done by machines mounted on tractors. The blades cut tendrils on either side and on top of the vine. But a tendril that grows out the end of a row won't be cut. And this vine figured it out. Tuesday was corn day at the Ken and Walt household. We planted sweet corn in our garden for the first time this past spring, and we actually got some corn. 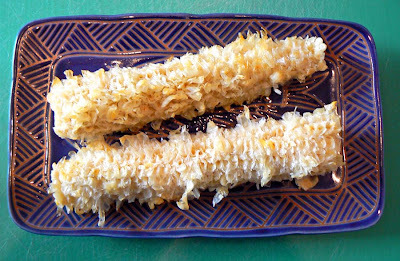 Edible corn. And I'm tellin' ya... It was some kinda good! The raw ears before I finished shucking them. The seeds came from the US -- Ken brought them back from his trip last February. There was one packet of white corn and one packet of yellow corn. About two thirds of the seeds actually came up and I was happy about that. Raw corn on the cob, ready for boiling! This week I decided that it was time to harvest a couple of the biggest ears. Last week, I pulled back the husk on one and tested a kernel. 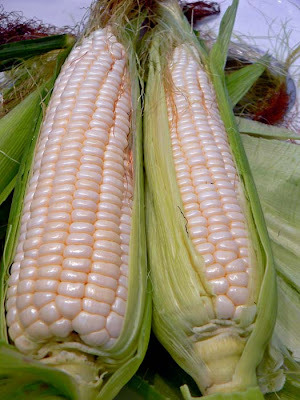 I read that if you pierce a kernel, and the liquid is milky, the cob is ready to harvest. Last week it wasn't ready. But this week things looked good. 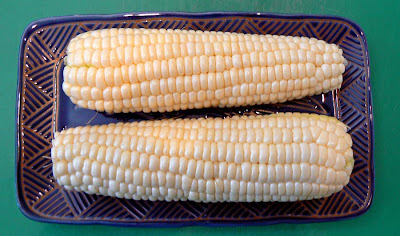 The cooked corn, ready for butter, salt, and pepper. I picked the two biggest ears. I shucked them and they looked wonderful. So we cooked them in boiling water and had them as an appetizer before lunch on Tuesday. Man, were they delicious! I'm hoping that the remaining ears will be as good! And here's what's left. It was delicious! There are a few more large ears waiting to be picked. Unfortunately, we have a bunch of smaller ears out there. We will see whether they get bigger or not. Even if they don't get bigger, there may be some good corn on them. We shall see. All in all, I'm encouraged and will get some more seeds for next year. 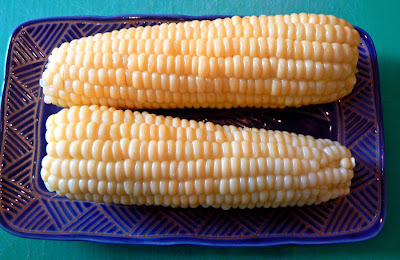 There's nothing like fresh-from-the-stalk corn-on-the-cob in August! Summer is winding down. There will still be nice days over the next couple of months, don't get me wrong. Monday night found us sitting out on the deck in shorts and t-shirts until after dark. It's still summer, after all. But the signs are out there. 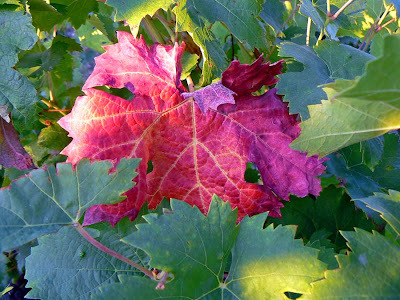 Some of the grape leaves in the vineyard are turning already. First of all, there's the dwindling light. I'm waking up before sunrise now. And darkness is coming earlier and earlier. The ads on television and in the mail are all about la rentrée (back-to-school and back-to-work). Summer vacations officially end next week. The US Open tennis tournament begins in less than a week. American football pre-season is in full swing. And then there are the leaves. The early changers have started doing their thing. I see more and more yellow leaves in the birch trees, and a carpet of yellow is forming on the ground beneath them. The grape vines have begun their transformation, too. Here and there I see a beautiful red leaf, or tinges of yellow among all the green. Gotta enjoy the nice days while they last! We've been having a great summer this year. Maybe you're tired of hearing about it. But our last two summers have been duds, so we're constantly amazed as the weather stays warm and dry for months on end. 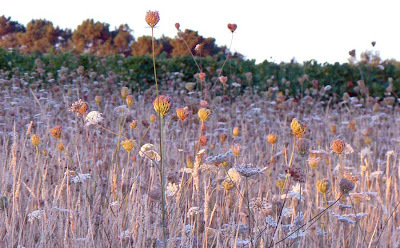 A field of Queen Anne's Lace and other wild flowers. Really, it's been pretty nice since March. I remember sitting outside in the sun in a t-shirt back on March first. We've spent a lot of time outdoors this year, and our garden is continuing to produce copious amounts of tomatoes and eggplants, not to mention all the greens we've had, the corn we're about to harvest, and the rest. A close-up in the sun. Out in the vineyard, the grapes are ripening. In another the month the harvest will be under way. 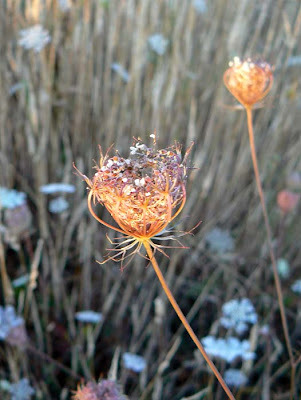 And right now the carotte sauvage (Queen Anne's Lace) is abundant in the fields between the vineyards. It's a sure sign of late summer. As fall gets under way, the seeds will form and the stalks will dry up. And they're really beautiful when they're dry, too. But right now they're spectacular. My photos don't capture all the subtleties in the fields of Queen Anne's Lace out behind our house, but maybe you get the idea. 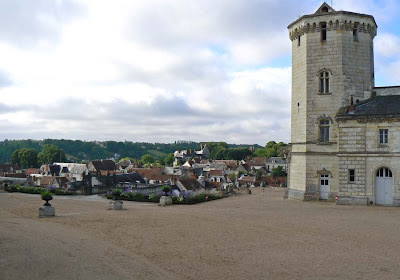 As most of you know, the Loire Valley is a popular tourist destination in France because of all of the royal châteaux up and down the river. 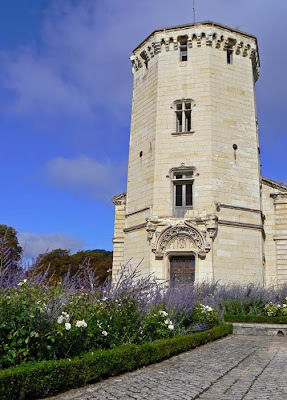 Where we live, we are in close proximity to four of the "biggies," namely Chambord, Chenonceau (the one pictured in the banner at the top of the blog), Cheverny, and Valençay. The balloon flying low in the Cher River valley. Hot air ballooning is a very popular tourist activity here as well. It gives people a chance to fly over some of the castles and vineyards that are spread all over the valley. 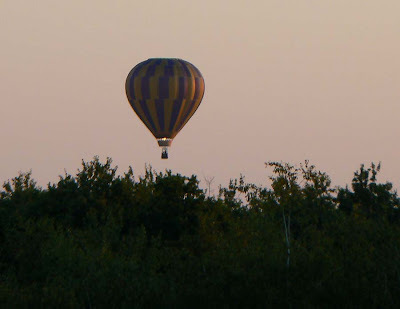 There are a few balloon operations based in our area and we will frequently see their craft floating by the house and over the vineyards. 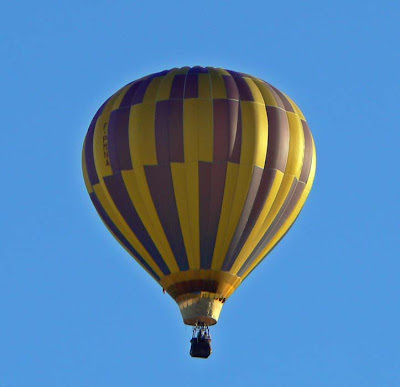 Hot air balloons are called montgolfières (after the inventors) in French. You can see the burner going in this shot (click to enlarge). This one came by at seven on Sunday morning. Callie and I were just heading out for our walk and we heard the tell-tale whoosh! of the propane burner keeping the air inside the balloon at the proper temperature. The sun was just coming up, so the photos are a bit dark, but I think they came out okay. An evening shot of the balloon. You can see its color better now. 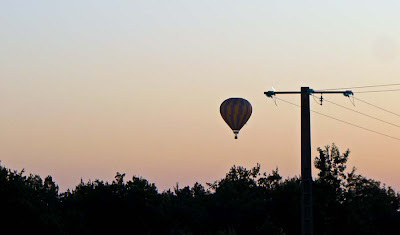 Later, in the evening, the balloon was back up and floated above the back yard and over the vineyard, so I snapped a closer shot (above). 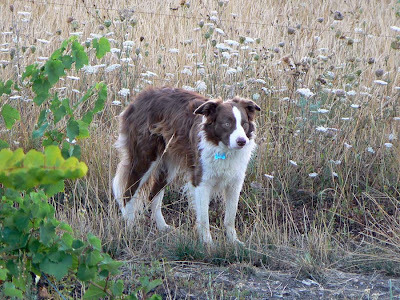 Back in June I took a little video of Callie barking at the balloon flying over the vineyard. If you didn't see it, you can find it here. The tomato harvest is going strong right now. We've made a few batches of sauce for freezing, a lot of salsa, and Ken even made ketchup this week. Not to mention all the great ways we've eaten fresh, ripe, juicy tomatoes right out of the garden. 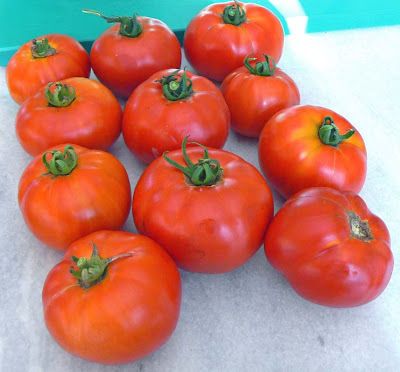 We've had tomato/basil/mozzarella salads, plain tomato salads, BLTs, and even tomato and mayo on toasted sandwich bread. There's some pico de gallo in the freezer, and a bunch of stuffed tomatoes, too. We've made many versions of ratatouille. And the 'maters still keep coming! Some small and medium sized toms. 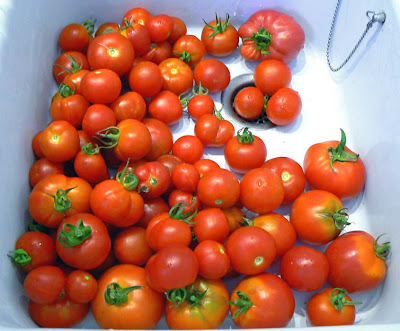 I suppose that's what happens when you plant thirty-seven tomato plants in your garden. I've been saving seeds from some of the best of them for next year. And I think we'll cut down on the quantity. The biggest, juiciest sandwich and stuffing tomatoes. All the tomatoes you see here were picked on Friday. Ken made another batch of salsa with some of the yellow ones. We used one of the big red ones for BLTs again. The rest may become another batch of sauce! A few of the white aubergines visible on the plant. We didn't know that there would be any white ones. 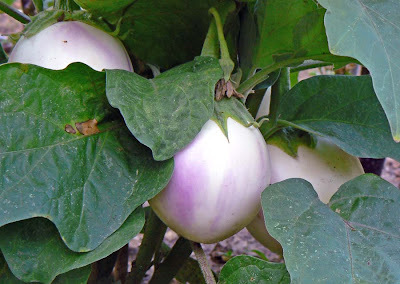 Last year we had a seed packet that was mixed eggplant: fat purple, skinny purple, and white. None of them worked, but I had a few seeds left over and I planted them again this year along with a fresh packet of skinny purple eggplant seeds. 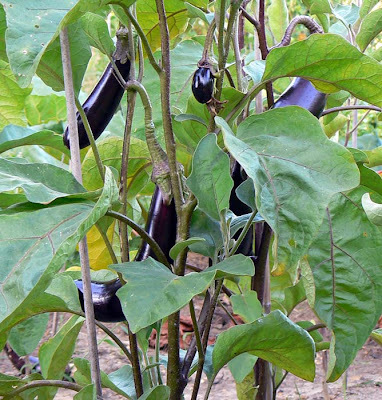 More purple aubergines on the way. When the seeds came up this spring, they really thrived. As I transplanted them out into the garden, it was clear that one of the plants looked different from all of the others. It turned out to be one of the white eggplant seeds from the previous year. We'll be harvesting these real soon. White wine. It's Ken's drink of choice for hot days. And not so hot days. And cold days. Me, I usually drink rosé, even during the winter. Our local rosés are very dry and good. 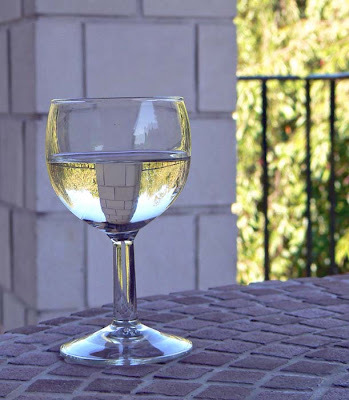 A glass of something white on the deck. But this is white, and it could be a chardonnay. Also very dry, and not wood-aged so it's quite crisp and fruity. It could also be a chenin, another of Ken's favorites that is produced in our area. Most white wines in our part of the Touraine, however, are made from the sauvignon grape. We buy all three, so I have no idea which one he was drinking on this particular day. Earlier this summer, each time Ken and I planned to have a cookout, the weather refused to cooperate and we were forced to cook and eat indoors. But August has turned into a fantastic summer month this year and we've been able to use the grill. The concrete backyard BBQ grill. We used to barbecue a lot back in California. I started out with the standard charcoal grill, but moved on to gas grills pretty quickly. The window of opportunity for grilling where we lived in San Francisco was small; no time could be wasted waiting for coals. Here in France, grilling is also very popular. Many people have gas grills, and some, like our neighbor, have electric grills (which are great for doing up sausages). There is, of course, the standard charcoal grill. I have two: a Weber Smokey Joe that we moved from California, and a backyard bbq that we bought at a local hardware store. My only problem has been with the charcoal. 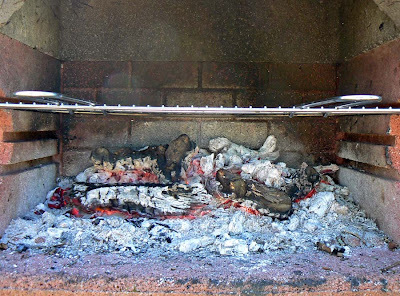 In France, you cannot find the typical American charcoal briquettes (is that a French word?). What they sell is bags of charbon de bois (wood charcoal). It's actual pieces of wood that have been burned into charcoal. The theory is that you light it and it quickly becomes a bed of hot coals, much in the same way that briquettes do. The wood fire is almost ready. I say theory because, while the charbon de bois gets hot fast, it also cools down very quickly, and I've not mastered the art of cooking on the stuff. Especially because I like to cook things like pork and chicken on the grill. They require low and slow cooking, and my coals end up either too hot or too cool to do the job properly. After a few years of frustrating grilling experiences, I discovered what might have been obvious to someone more quick on the uptake than I: wood fires. 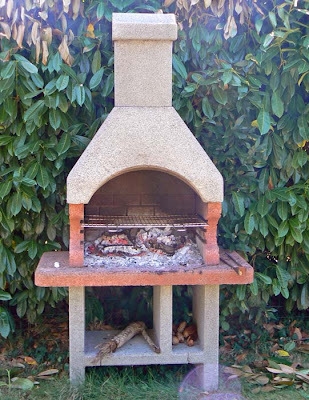 In the big concrete bbq, all I have to do is build a small wood fire. When it burns down, I end up with a bed of hot coals that last through the cooking process. The added bonus is that we live in wine country. That means there's an almost unlimited supply of old grape vine trunks to burn. All the people we know tell us that grape trunks make the best barbecues. The wood burns hot and makes great long-lasting coals, and the flavor of the smoke is greatly appreciated. Callie brings home BBQ fuel. 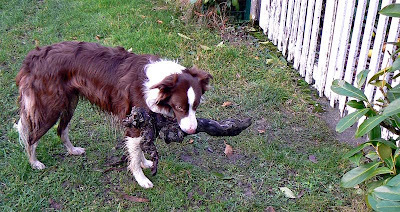 And we're even luckier in that we have a dog who loves to bring old vine trunks home after her vineyard walks. She made a nice pile of the stuff for us last winter, and we're looking forward to another haul as the pruning season gets under way later this year. It's great to have a working dog! So I'm a convert. 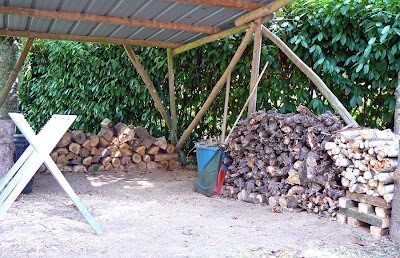 The wood fires are easy to build, and they don't take much longer than traditional briquettes to be ready for cooking. Now, is that meat marinated yet? I love port. Either as an apéritif (before the meal) or a digestif (after the meal). On Saturday I had some after our chicken barbecue. Enjoying a glass (or three) of port on the deck. 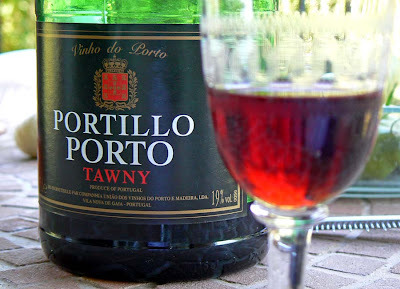 The first time I tried port, I was on a United Airlines flight from Paris to San Francisco. I think it was in 2000. I had been bumped the day before and the next day they upgraded me to business class. After an amazing meal -- I never knew that airline food could be so good -- the flight attendant pushed a little cart down the aisle. The cart was covered with a white cloth. On it was a silver tray with a bottle of port, and a small number of glasses. With a knowing smile, she offered me some port. Yes please! I said. And I was hooked. I had a second glass. Since then I've always tried to have a bottle in the house. One bottle can last a long time, or it can go quickly, depending. And I like both ruby (bottle aged) and tawny (aged in wood barrels). Port comes from Portugal, in the northern region along the Duoro River, and takes its name from the city of Porto at the river's mouth. There are good, inexpensive ports in most French supermarkets. 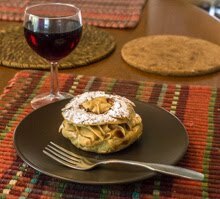 Porto is commonly offered among the apéritifs in many French homes, and it's one of my favorites. I'm sure there are very good, very expensive ports to be had, but I'm not much of an aficionado. I just like to drink it. This bottle says tawny, but it looks more like ruby. Must be a young tawny. I've never tried a white port, but they exist. Tchin tchin! 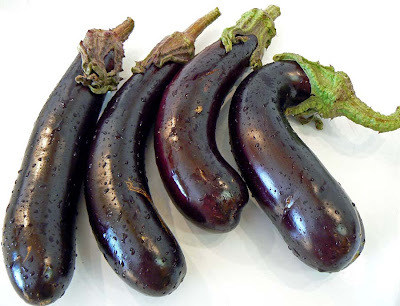 Aubergines, called eggplant in American English. The plants are covered with many more, so we're hoping that the weather will be kind so they can mature. These, by the way, were delicious. 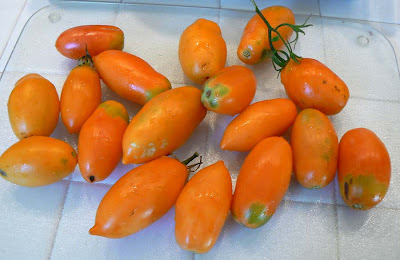 Ken and I stopped at a garden center near Romo on Wednesday and picked up some seeds for next year: more aubergine, radishes, courgette, and some roma tomatoes. I'm already anxious for next spring! 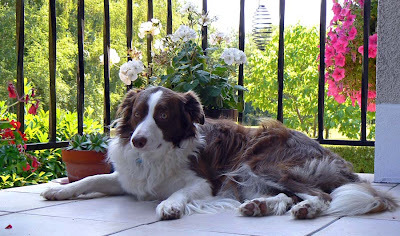 Callie relaxing on the deck on a summer's afternoon. Sometimes she looks like a deer caught in headlights in photos. 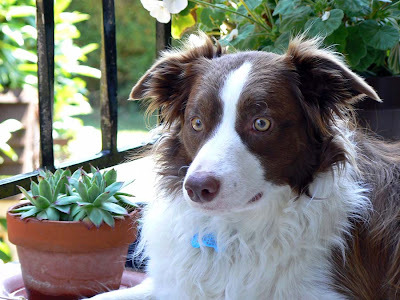 In real life her eyes are very active and expressive and they always betray her doggy emotions. On this day she was relaxing with us on the deck so I grabbed the camera for about a dozen shots. She just watched me as if to say, "There he goes again with that thing. I'll just sit here and look pretty." 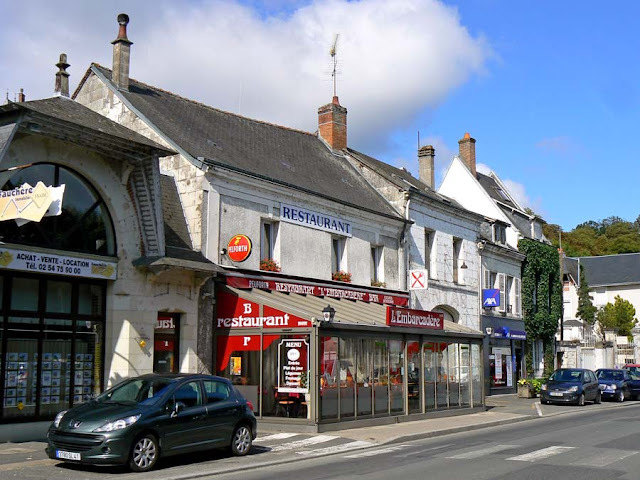 So here's the Saint-Aignan-sur-Cher series winding down. I really had a good time taking and posting the photos, researching (but not too much) some of the history, and reading your comments. 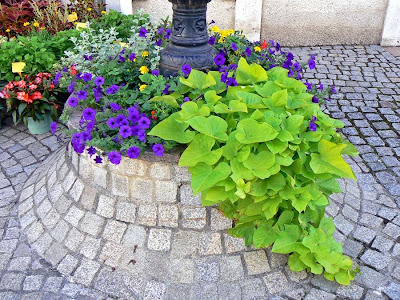 A lamp post and street planter in the town center. 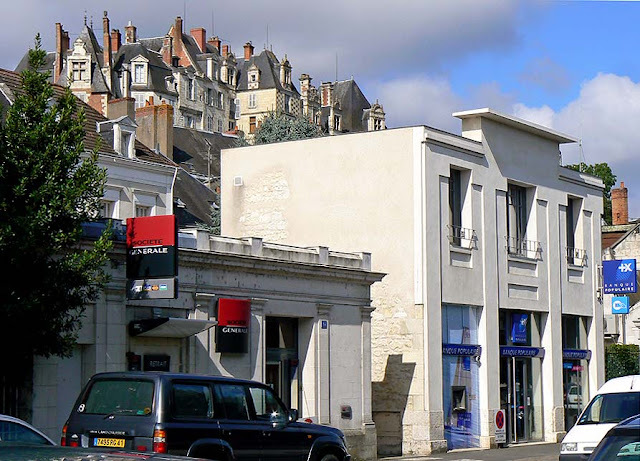 There's so much more that I could photograph and show you in and around St.-Aignan, and I probably will over time. 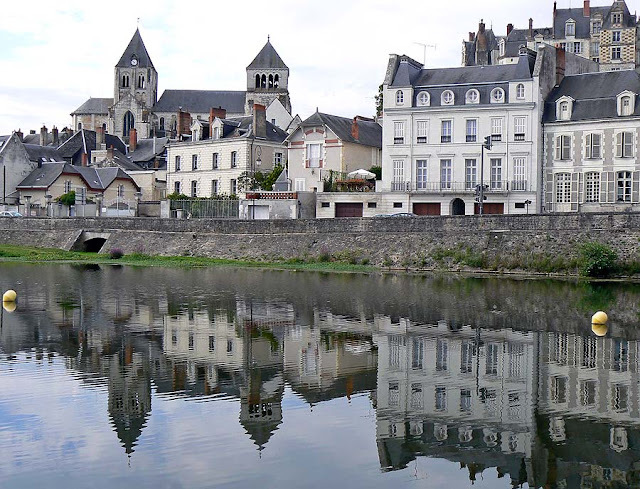 Not to mention that there are so many little towns and châteaux around this region. Somebody in town enjoys all things blue. My basic problem is that I'm a homebody. I really don't like going out and about a lot, even when I have a good time. I'm just not motivated to leave the house and garden. Go figure. 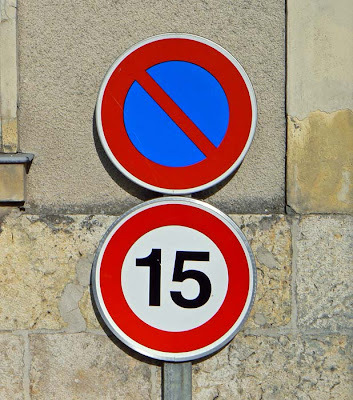 No Parking; Speed Limit 15 kph. So now I have to find other subjects for the blog. Back to the yard and garden, or the vineyard. We're past mid-summer now, and things are changing out there. I'll see what I can find. 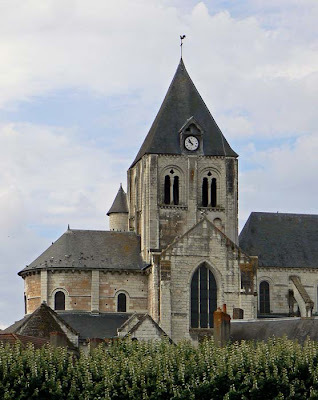 A parting shot of St.-Aignan's church. Notice the little flying buttress on the lower right. The bridge. 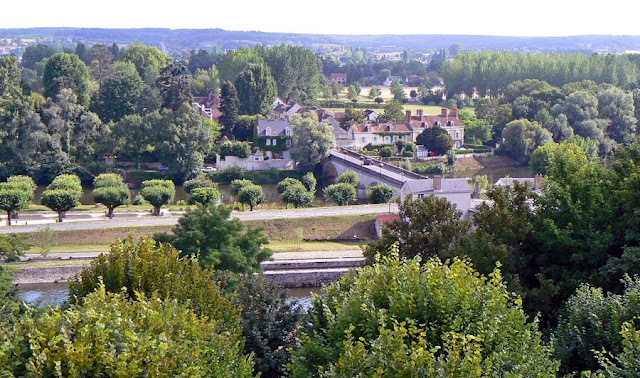 It connects St.-Aignan with Noyers-sur-Cher to the north across the Cher River. 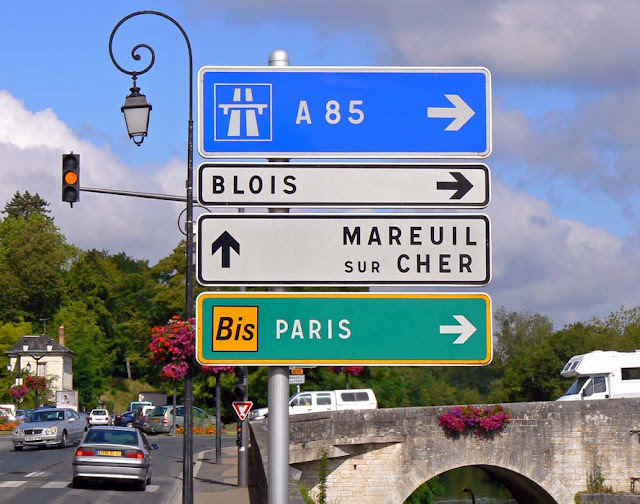 The road continues northward through the Forêt de Gros Bois to the town of St.-Romain (another wine town), then up to Contres and on to Blois. 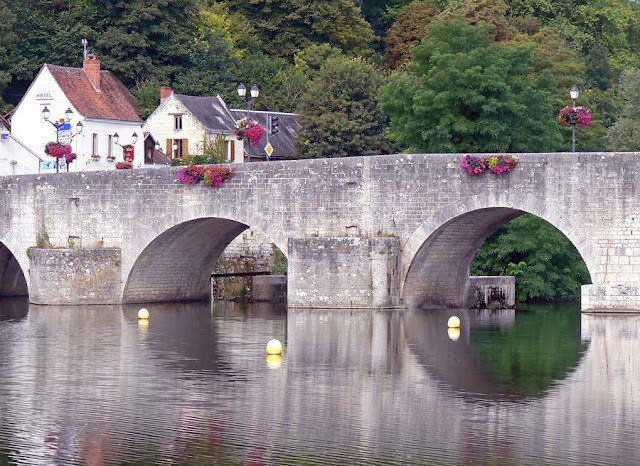 The St.-Aignan side of the bridge over the Cher. The bridge crosses two branches of the river which are separated by an island. There is an actuated traffic signal on the island and a standard signal on the St.-Aignan side. The bridge is only two lanes wide but it still handles pedestrians, bicycles, cars, campers, and big rigs. It can be a tight squeeze from time to time. This is the section where the former mill stood. I always kid Ken that we need to head out early if we want to avoid "bridge traffic." Although I'm only half kidding... During the summer there is a lot of tourist traffic and the town turns the signal to flashing to keep traffic from backing up on the bridge. The downside of that is that cars on the river road have to yield, and the wait can be frustrating. But certainly never as frustrating as waiting at the SF Bay Bridge toll plaza. A bridge pier on the island. 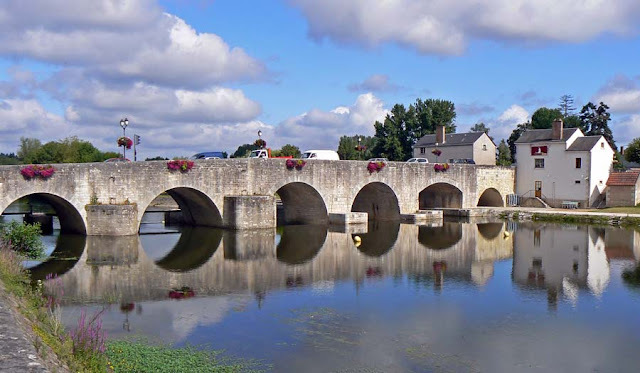 There has been talk of building a second bridge at St.-Aignan to handle the increasing summer time and truck traffic, but there is a debate about where to build it, and the current economic crisis has slowed things down. I really don't want to see a second bridge built. We don't need to accommodate vehicular traffic to that extent. There's my former career rearing it's ugly head! Directional signs at the St.-Aignan traffic signal, which is flashing yellow giving the right of way to traffic coming off the bridge. The Embarcadero (we use the Spanish word in English, how odd*), or the waterfront. St.-Aignan's waterfront is a relatively modern development. 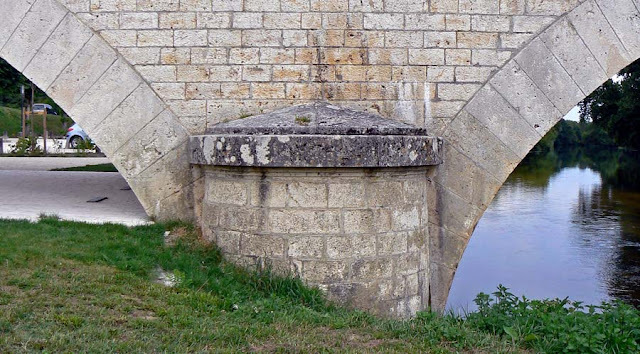 In the medieval days, a wall ran along the river; there was no roadway. The western waterfront. 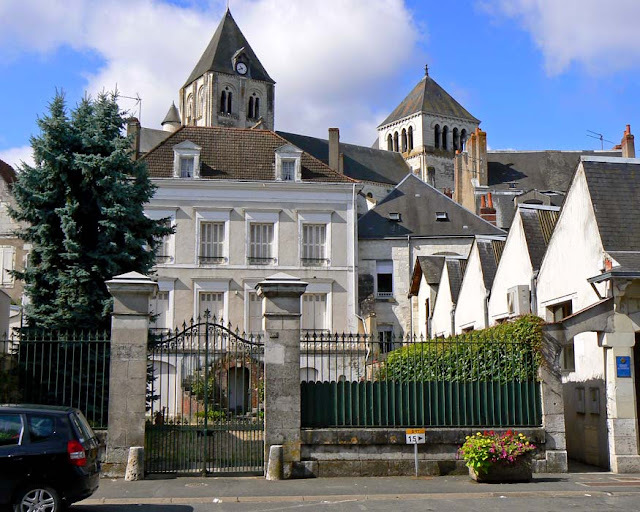 Part of the château is on the right and the collégiale church is on the left. But now there is a small quay and a new roadway that takes modern traffic around rather than through the center of town. There's also a small allée of plane trees to spiff it up a bit. 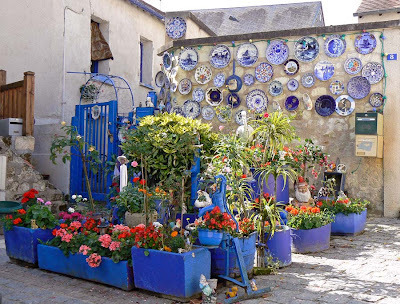 An antiques dealer with courtyard parking. 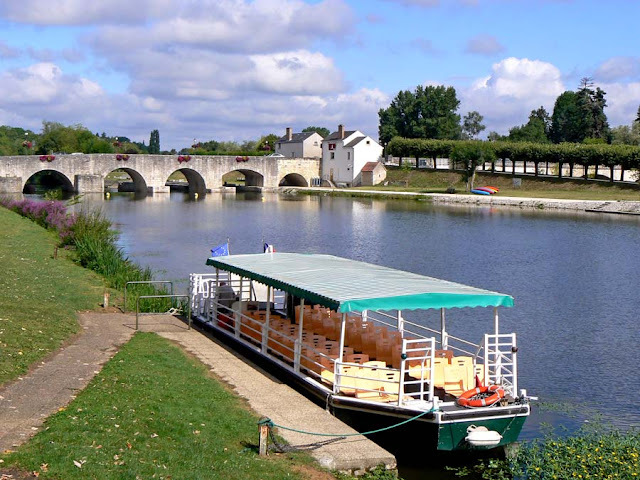 During the summer months, a pleasure boat gives rides to tourists from St.-Aignan upriver and back. I've seen it operating, but I've never actually taken a ride. Another thing to do one of these days. The pleasure boat docked at the embarcadère. There is one restaurant on the waterfront called, curiously enough, L'Embarcadère. It's a café/bar/restaurant that was taken over by new owners a few years ago. The décor was updated as was the menu. And it ain't half bad! The second restaurant on the waterfront is in the Grand Hôtel, which also has new owners recently. The restaurant bills itself as "traditional;" it's classic French with local specialties. We've eaten there before it was re-done, but not since. We don't go out to eat much! But, again, one of these days I'm sure we'll find an occasion to try it out. 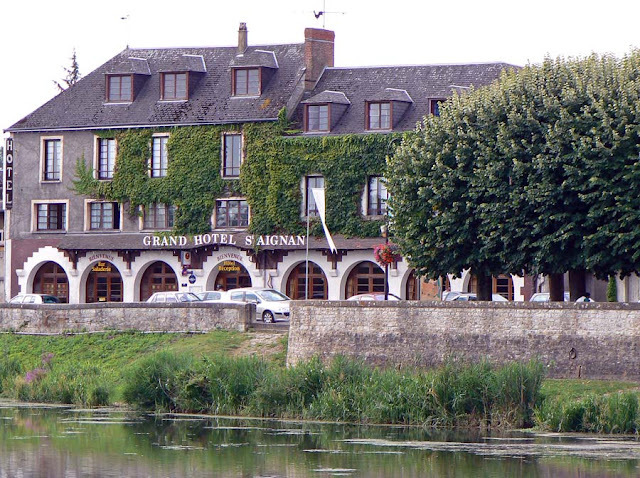 Le Grand Hôtel de St.-Aignan. Other businesses along the waterfront include banks, insurance offices, a real estate office, an antiques dealer, and a medical lab. You can also find St.-Aignan's only regional bus stop there, and two of the town's three traffic signals are at either end of the waterfront street, which is called Quai Jean-Jacques DeLorme. Bank branches below the château. There are many private residences along the waterfront as well. 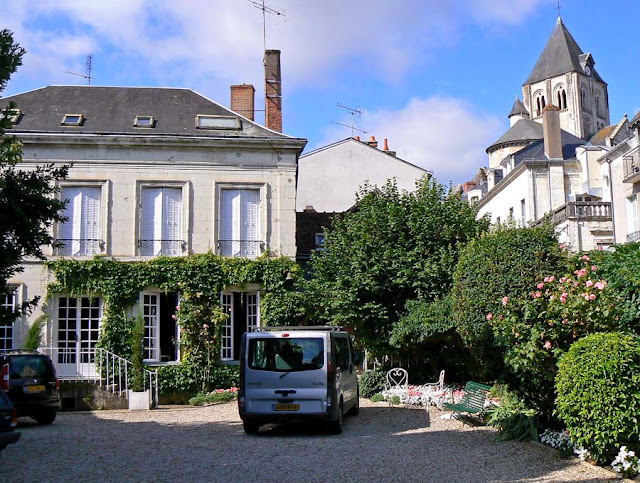 Some are big maisons bourgeoises (townhouses) with courtyards facing the river. Others are smaller, more modest buildings. Most are lived-in, although the traffic along the street must be rather noisy. *Maybe it's just in California that the Spanish word is used. I don't know. 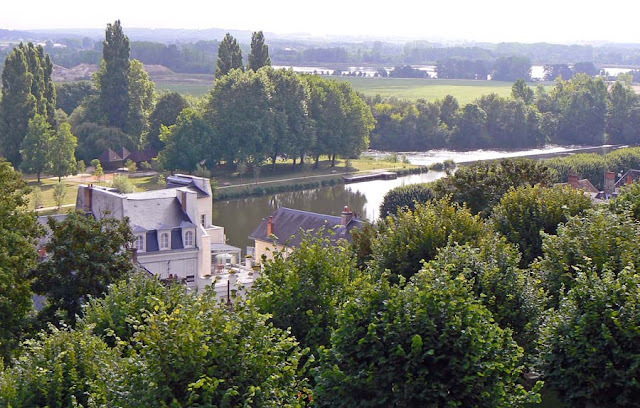 St.-Aignan's château's terrace sits up above the river and faces north. There's an island in the river here which is a park on its upriver end and a collection of garden plots on its downriver end. The bridge neatly bisects the island. Looking roughly east, upriver, with the town's roofs sloping down to the water. Also on the island is a small bistro. We haven't been there since it became a bistro; its previous incarnation was a small bar which we visited once for a beer with friends. It was nice enough, but it was a bit expensive. One of these days we'll need to check out the bistro. If it lasts, that is. Looking roughly west, downriver. The pool is in the center left. 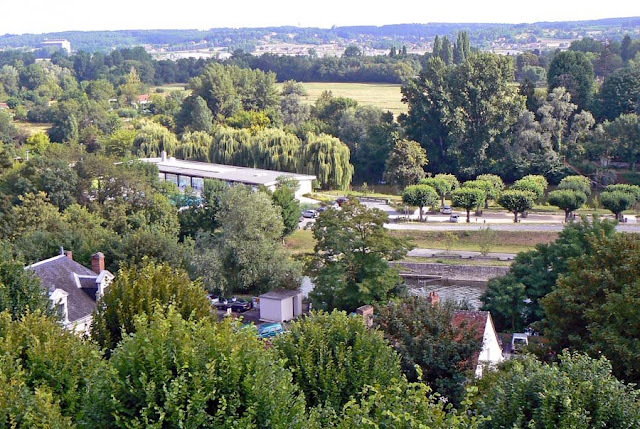 The other attraction on the island is St.-Aignan's municipal swimming pool. There are actually two pools, one indoors and one outdoors. Both are hubs of activity all summer long. The hours are reduced drastically through the winter, even for the indoor pool. Looking roughly north, with the island and bridge in the center. The views of the valley are always changing, depending of course on the season and the weather. The morning I took these pictures, it was mostly sunny, but there were some clouds and morning haze burning off. Some days when the weather is dry and crystal clear, you feel you could reach out and touch the horizon. Other days when its wet and rainy, it's difficult to see even as far as the river. Sometimes the clouds are low enough that there is no view at all. A view to the northeast and the eastern tip of the island. The Court of Honor. 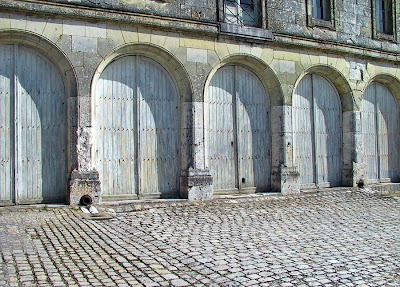 This is a general term for the interior courtyard of a château or other large building or complex of buildings. I think. 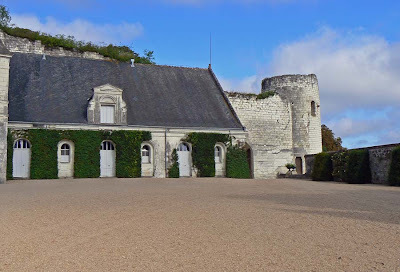 At any rate, St.-Aignan's château has a cour d'honneur that is open to the public. It's also the owner's parking lot. The castle's main interior staircase in the renaissance wing. 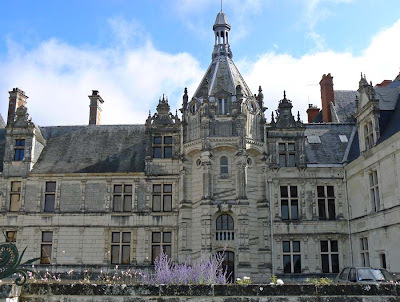 The château itself forms most of the north border of the courtyard and wraps a little around the eastern side where a grand stair comes up from town. A very noticeable feature on the courtyard side of the château is the circular stair; it was modeled after a similar but more elaborate stair in the royal château in Blois, about twenty-two miles north of St.-Aignan. A southeastern view with the octagonal tower on the right. On the south side of the courtyard, there is an octagonal tower, a remnant of the earlier castle on the site, and stable buildings. Through the windows in the tower you can see some hunting trophies (read: stuffed heads and antlers) and other hunting paraphernalia. A closer look at the octagonal tower. On the western side of the courtyard, built onto the vestiges of the medieval ramparts, is a building that served as the servants' quarters and workshops. There is also the coach gate that leads out of the courtyard, past the gatehouse, and down a sweeping drive way to the town below. The former servants' quarters against the medieval wall and round tower. The best feature of the courtyard is that you get views not only of the town below, but of the river and valley beyond. 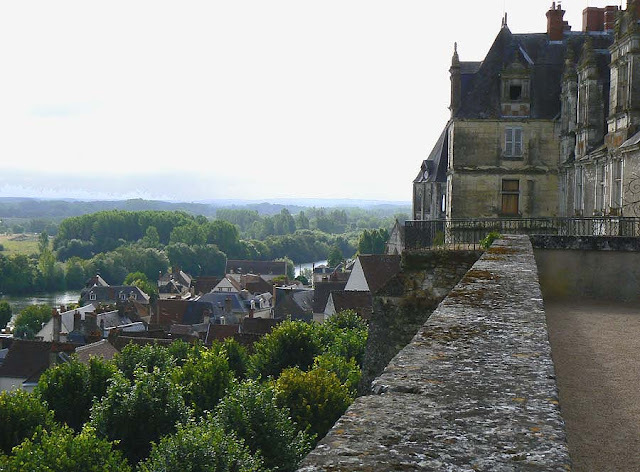 There is a large terrace off the renaissance wing of the château that faces north overlooking the river. On clear days, the views are pretty nice, but we'll get to those later. The doors of what I think are the old stables and carriage barn.